Length of blossom clusters : 70-80cm. 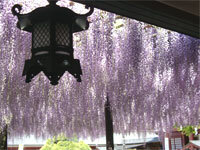 The shrine's two aged wisteria trees put out their blooms regularly around May 10 each year. The wisteria beside the Romon gate produces butterfly-shaped blooms of a light violet color, in tassels which sometimes reach 150 centimeters in length. The double-blossomed wisteria beside the Hall of Worship is an unusual seedless variety which produces deep purple flowers, thickly clustered like bunches of grapes.